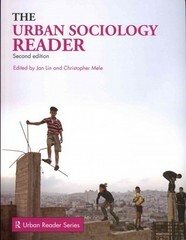 The Urban Sociology Reader 2 Edition The urban world is an exciting terrain for investigating the central institutions, structures and problems of the social world and how they have transformed through the last 200 years. This Reader comprises sections on urban social theory, racial and social difference in the city, culture in everyday life, culture and the urban economy, globalization and transnational social relations and the regulation of urban space. Drawing together seminal selections covering the nineteenth to the twenty-first centuries, this Reader includes forty-three significant writings from eminent names such as Simmel, Wirth, Park, Burgess, DuBois, Zukin, Sassen, and Harvey. The 2nd edition illuminates more recent urban issues such as sprawl, sustainability, immigration and urban protest. Selections are predominantly sociological, but some readings cross disciplinary boundaries.Providing an essential resource for students of urban studies, this book brings together important but, till now, widely dispersed writings. Editorial commentaries precede each entry; introducing the text, demonstrating its significance, and outlining the issues surrounding its topic, whilst the associated bibliography enables deeper investigations.